BioWare has announced Darkspawn Chronicles, a new DLC add-on for Dragon Age: Origins that gives players a chance to find out how the other side lives. Dig, if you will, a picture of a world in which you, the hero of the Grey Wardens, did not survive the Joining; that you instead yakked up some blood, did the funky chicken for a few seconds and then went to the big elven ghetto in the sky, leaving Alistair to lead the Grey Wardens against the Darkspawn menace alone. What would happen? Apparently you'd become a hurlock vanguard and lead the forces of the Darkspawn on their bloody quest to raze Denerim to the ground! At least, that's the story in Darkspawn Chronicles, the upcoming "alternate history" Dragon Age DLC pack. As vanguards, players will have access to the "Enthrall" power, letting them recruit any Darkspawn they meet: Genlocks, hurlocks, shrieks and even the towering ogres. 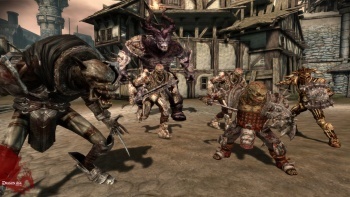 Players who complete the expansion will be given an "epic Darkspawn item" for use in Dragon Age: Origins and Awakening. Dragon Age: Origins: Darkspawn Chronicles is set to come out on May 18 for the PC (400 BioWare points) and Xbox 360 (400 Microsoft points) while the PlayStation 3 release date will be announced later. For more information, check out dragonage.com.